Sea kayaking is one of the most beautiful ways to see the natural beauty of Australia's waterways. Sea kayaking and canoeing is easy, safe and fun for all ages. 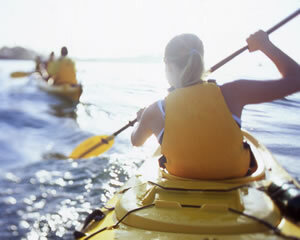 Sea kayaking is majestic and fun to share with friends or family. Canoeing or sea kayaking gives you the best seat in the house to see Australia's beauty. It must be put on your to do list. Sea kayaking is just as enjoyable for beginners as it is for those more experienced. Get out on the water and enjoy sea kayaking and canoeing. The Adelaide Dolphin Sanctuary Kayak is an ideal location for novices and children to experience the fun and adventure of kayaking. 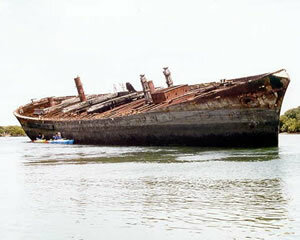 You can explore protected mangrove creeks, see some ship wrecks or search for dolphins. All the family can have fun and be active together! The Dolphin Sanctuary is a "secret spot", incredibly beautiful and just 10 min. from Pt. Adelaide! Here the sheltered creeks are home to fascinating marine life, birds and the Port River Dolphins. The Ship's Graveyard is a unique feature of the area. Great for a sensational kayaking adventure. Join us for one of Adelaide's best eco-adventures. The sheltered, tree lined creeks of the Adelaide Dolphin Sanctuary are an ideal environment for a kayaking adventure. Travelling by kayak is a unique way to see the dolphins or view the ship wrecks in the Maritime Heritage Trail. Rowing is complicated! Beginner's Rowing On The Yarra at Toorak is about competence in one of the oldest Olympic sports. Indulge in a sport that is usually inaccessible. Take rowing on the Yarra so not only are you learning 'oarsome' skills, but you're doing it in the best possible location! Journey with us into nature, kayaking the waters of the Bongil Bongil National Park. Encompass an array of rich and diverse plant and animal communities, with unspoiled beaches, wetlands, littoral rainforest and pristine estuaries. It's time to reconnect with nature. Kayaking on the Brisbane River No matter what the weather! Riverlife's guided kayaking adventure sessions let's you see the city from a unique angle while you glide along the meandering Brisbane River! Have a fun day while gaining confidence and skills in a canoe or kayak on the Yarra River. Our professional guides will teach you some basic strokes and then take you through some exciting rapids. Suitable for individuals, couples or groups! Join us on a cruising paddle for a relaxing time amongst the gum trees that line the quiet waters of the Yarra River near Melbourne. Twilight is a great time to spot birds, flying foxes stirring and other sorts of wildlife or to simply wind down after a busy day at work. Have a fun day while gaining confidence and skills in a canoe on the Yarra River. Our professional guides will teach you some basic strokes and then take you through some exciting rapids. Sight seeing with a difference! Enjoy canoeing the beautiful Brisbane River whilst marvelling in the picturesque view of the city at water level. Paddle past Brisbane landmarks such as the Story Bridge or South Bank in your canoe - you'll be amazed at the view! A different way to sight see- Enjoy the beautiful Brisbane River whilst marvelling at the picturesque view of the city by canoe. Paddle past Brisbane landmarks such as the the Story Bridge and South Bank. 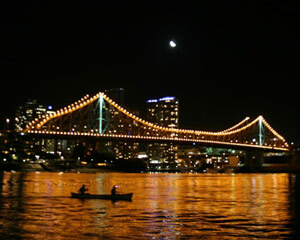 What better way to view Brisbane city at night, than from the safety and comfort of your own 2-person canoe! The Story Bridge and Brisbane city buildings transform to a city of fairy lights as you paddle peacefully through the evening before finishing off with supper! Discover the essence of the Australian bush on a canoeing safari on the beautiful Goulburn River in Northern Victoria. The river gently meanders through the massive red gum forest and this is the ideal place to lose yourself and all whilst paddling in a canoe among this lush environment! Discover the essence of the pristine Australian bush on a canoeing safari on the beautiful Goulburn River in Northern Victoria. The canoeing adventure takes you deep into a natural habitat of many species of water and forest birds, and whilst there you will also enjoy a delicious picnic lunch. Discover the essence of the pristine Australian bush on a canoeing safari on the beautiful Goulburn River in Northern Victoria. The half day canoeing adventure takes you deep into the southern section of the huge Barmah Forest, a natural habitat for many species of water and forest birds. Join us in a canoe adventure amongst the gum trees that line the quiet waters of the Yarra River near Melbourne. Twilight is a great time to spot birds, fruit bats and other sorts of wildlife or to simply wind down after a busy day at work! Explore Brisbane city at night, from the comfort of your own 2-person canoe! The Story Bridge and Brisbane city buildings transform to a city of fairy lights as you paddle peacefully through the evening. This is Brisbane at its best, the views are spectacular. Join us on this fully guided Daintree Rainforest walk, including a wildlife river cruise in seach of the saltwater crocodile. Canoe down the Daintree's stream and take a dip in a freswater lagoon. Our guides are experts in the local flora and wildlife and guarantee a day with plenty of fun! Climb aboard a kayak to Melbourne's Docklands. Experience Melbourne's newest waterside suburb, so get set to glide long the Yarra, soaking up panoramic views of the city and passing some of Melbourne's famous sights. Savour a dinner of fresh fish and chips. Join us for a kayak tour around Adelaide and discover shipwrecks in the Ship's Graveyard Maritime Heritage Trail and meander through the mangrove lined channels around Garden Island. If you're lucky, you might even spot some of the resident dolphins on this tour. Join us for a person small group kayak tour around Adelaide and discover Dolphins and shipwrecks in the Ship's Graveyard Maritime Heritage Trail and meander through the mangrove lined channels around Garden Island. We ofen see some of the resident dolphins.